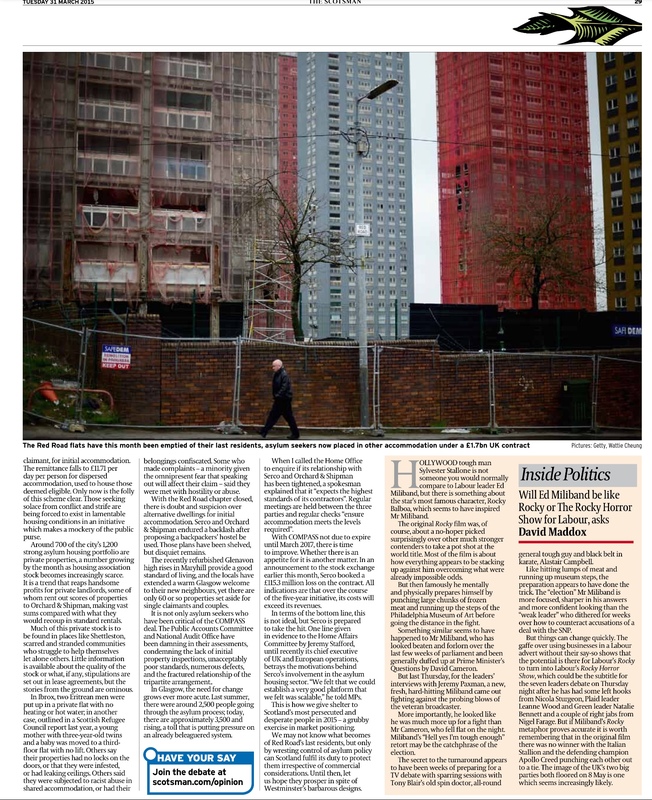 FOR close to half a century, the colossal structures of the Red Road flats have been a conspicuous presence on Glasgow’s jagged skyline, yet the shadows cast by their steel frames reach far enough to hide the most uncomfortable of truths. This month, the notorious Brutalist tower blocks bade farewell to their final residents. It was a departure that went largely unheeded. Goodbyes to Petershill Drive were said in a variety of languages and in haste; when you are an asylum seeker in 21st century Britain, home is as transient a concept as it is complicated. If it is a proud British tradition to tend to the lowly and comfort the afflicted, Westminster’s disdain for Glasgow’s most vulnerable inhabitants suggests it is no longer in vogue. In a city which owes its very identity and industry to the toil of immigrants, an invidious process of outsourcing is inflicting untold pain on those who are already victimised. Every horror story requires a chilling cast. 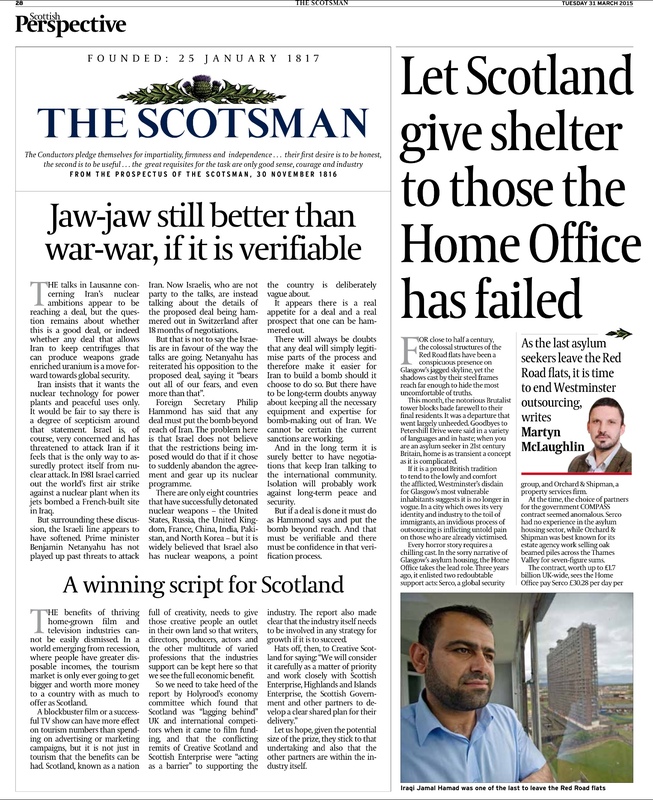 In the sorry narrative of Glasgow’s asylum housing, the Home Office takes the lead role. Three years ago, it enlisted two redoubtable support acts: Serco, a global security group, and Orchard & Shipman, a property services firm. At the time, the choice of partners for the government COMPASS contract seemed anomalous. Serco had no experience in the asylum housing sector, while Orchard & Shipman was best known for its estate agency work selling oak beamed piles across the Thames Valley for seven-figure sums. The contract, worth up to £1.7 billion UK-wide, sees the Home Office pay Serco £30.28 per day per claimant, for initial accommodation. The remittance falls to £11.71 per day per person for dispersed accommodation, used to house those deemed eligible. Only now is the folly of this scheme clear. Those seeking solace from conflict and strife are being forced to exist in lamentable housing conditions in an initiative which makes a mockery of the public purse. Around 700 of the city’s 1,200 strong asylum housing portfolio are private properties, a number growing by the month as housing association stock becomes increasingly scarce. It is a trend that reaps handsome profits for private landlords, some of whom rent out scores of properties to Orchard & Shipman, making vast sums compared with what they would recoup in standard rentals. Much of this private stock is to be found in places like Shettleston, scarred and stranded communities who struggle to help themselves let alone others. Little information is available about the quality of the stock or what, if any, stipulations are set out in lease agreements, but the stories from the ground are ominous. In Ibrox, two Eritrean men were put up in a private flat with no heating or hot water; in another case, outlined in a Scottish Refugee Council report last year, a young mother with three-year-old twins and a baby was moved to a third-floor flat with no lift. Others say their properties had no locks on the doors, or that they were infested, or had leaking ceilings. Others said they were subjected to racist abuse in shared accommodation, or had their belongings confiscated. Some who made complaints – a minority given the omnipresent fear that speaking out will affect their claim – said they were met with hostility or abuse. With the Red Road chapter closed, there is doubt and suspicion over alternative dwellings for initial accommodation. Serco and Orchard & Shipman endured a backlash after proposing a backpackers’ hostel be used. Those plans have been shelved, but disquiet remains. The recently refurbished Glenavon high rises in Maryhill provide a good standard of living, and the locals have extended a warm Glasgow welcome to their new neighbours, yet there are only 60 or so properties set aside for single claimants and couples. It is not only asylum seekers who have been critical of the COMPASS deal. The Public Accounts Committee and National Audit Office have been damning in their assessments, condemning the lack of initial property inspections, unacceptably poor standards, numerous defects, and the fractured relationship of the tripartite arrangement.. In Glasgow, the need for change grows ever more acute. Last summer, there were around 2,500 people going through the asylum process; today, there are approximately 3,500 and rising, a toll that is putting pressure on an already beleaguered system. When I called the Home Office to enquire if its relationship with Serco and Orchard & Shipman has been tightened, a spokesman explained that it “expects the highest standards of its contractors”. Regular meetings are held between the three parties and regular checks “ensure accommodation meets the levels required”. With COMPASS not due to expire until March 2017, there is time to improve. Whether there is an appetite for it is another matter. In an announcement to the stock exchange earlier this month, Serco booked a £115.3 million loss on the contract. All indications are that over the course of the five-year initiative, its costs will exceed its revenues. In terms of the bottom line, this is not ideal, but Serco is prepared to take the hit. One line given in evidence to the Home Affairs Committee by Jeremy Stafford, until recently its chief executive of UK and European operations, betrays the motivations behind Serco’s involvement in the asylum housing sector. “We felt that we could establish a very good platform that we felt was scalable,” he told MPs. This is how we give shelter to Scotland’s most persecuted and desperate people in 2015 – a grubby exercise in market positioning. We may not know what becomes of Red Road’s last residents, but only by wresting control of asylum policy can Scotland fulfil its duty to protect them irrespective of commercial considerations. Until then, let us hope they prosper in spite of Westminster’s barbarous designs.